3. Shipments are through Delta or Southwest Airlines air cargo. Freight charges, within 50 lb are approx. $120, over 50 lb and within 100 lb approx. $170 and will be collected by the airline when picking up the package. 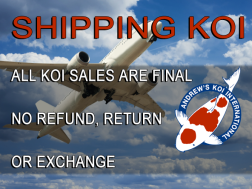 A regular sale price value will be declared with the airline at the time of shipping. If you notice any damage to the package you need to make a claim with the airline immediately. 4. Neither we nor the Airlines will be held responsible for aircraft or equipment mechanical problems, adverse weather conditions, operational difficulties, Air Traffic Control difficulties, etc.